The wind started to get up gusting between 40-50 mph and snowing. It got very difficult, we couldn’t see anything, so we stayed put. We camped, it was very boring lying around all day with the tent banging and crashing, the wind was so bad we thought the tent was going to tear to shreds, we had a whole night of it buffeting and banging around. The wind dropped away, it was gusting now and then but it wasn’t too bad and when it stopped snowing the visibility was good. The wind had blown the trail so it was nice and hard, we managed to do about 34 good miles. We went straight through Fort Yukon, which is an Indian village with about 600 people living there, and camped outside on the Yukon River which is a very beautiful place. 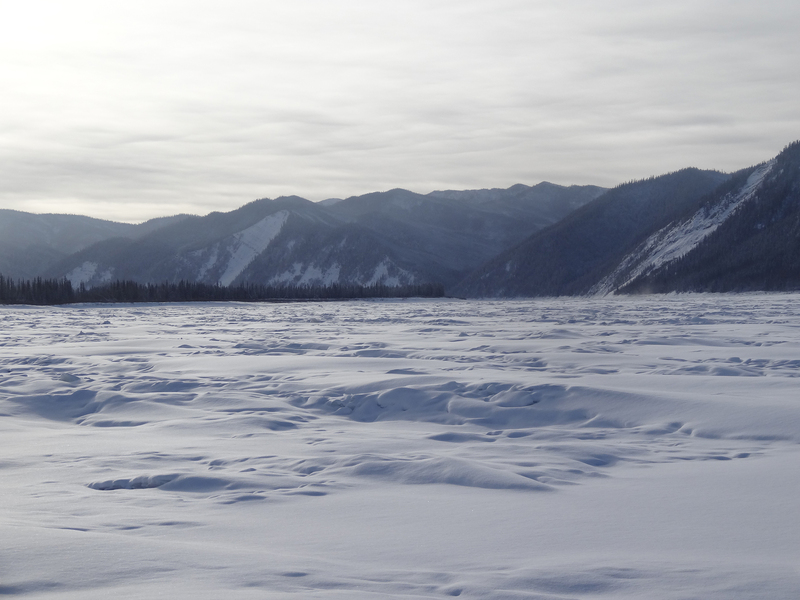 Now we are on the Yukon River and continuing to head SE. The days are getting longer by 10 minutes a day. When we were in Inuvik further north they were getting longer by 15 minutes a day. When we get to Eagle it will be 7 minutes a day. We are still over 200 miles from Eagle. We are heading down to Circle now, we have another day to camp then we should be at Circle, that’s assuming there isn’t a storm or something. After Circle we should be able to stay in cabins. Today it is clear and sunny, the going is very slow as the snow is so deep from the storm. We are only making about 3 miles an hour. As we go south it will get warmer and warmer, so earlier today it was -12º but it is now only -7º so the dogs overheat and we have to keep stopping to let them cool down. Otherwise everything is good. We are making headway. We think we are going to be about 5 days early arriving at Eagle. We got up really early and sledged 40 miles. The weather is getting warm now in the day time, so we need to sledge when the day is cold. Arrived in Circle and had my first change of clothes! We are staying in the Circle Fire Station, where they keep the fire truck, sleeping on the floor. The Municipal laundry has a shower and we have had our first shower since the start of the expedition! Only 4 more days of trail. 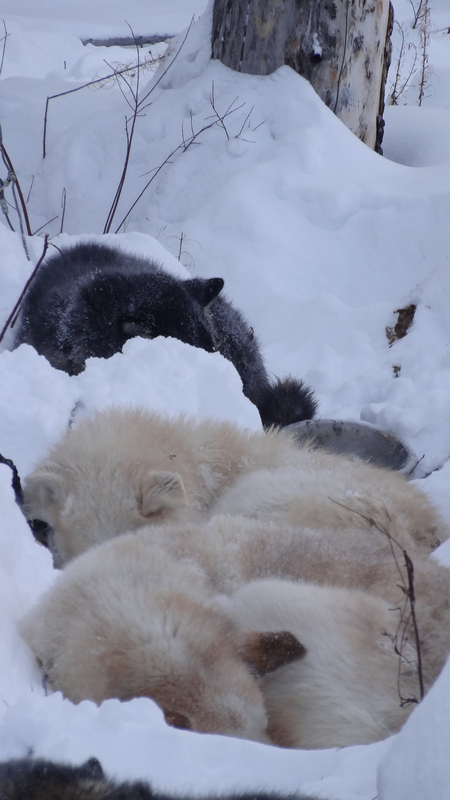 We have all suffered mild frostbite especially on the fingers and toes, but the dogs are looking really good despite this long journey. The weather is very warm and the days are getting longer, the snow is getting slushy and there is a lot of jumble ice that is very tricky and tipping our sledges over. Have done another 40 miles today to get to Kandik cabin. 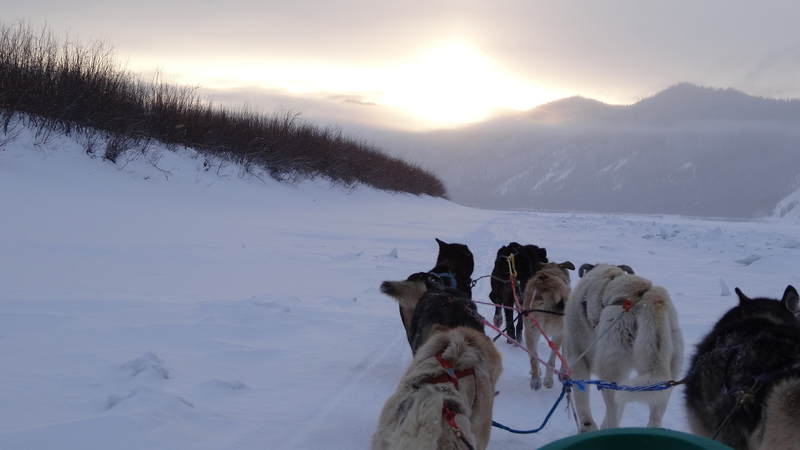 We are running on the Yukon Quest race trail now. We should be at our destination in two to three days. Brilliant job guys. Pleased you and the dogs are holding up. My heavens Tim that first shower and change of clothes must have felt good. Even the cold floor of the fire station sounds good compared with where you have been sleeping! Only three more days. - well done and what am amazing, triumphant achievement!! Best, Tom.